The value of this work is well recognised internationally. 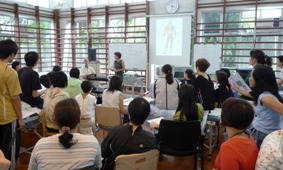 ISBT-Bowen Therapy is also accepted in the public hospital system in Hong Kong and is included in the myofascial component of the Masters of Physiotherapy course at the historic Aveiro University, Portugal. The International School of Bowen Therapy (ISBT) Directors Lisa Black and Col Murray developed ISBT-Bowen Therapy based on the principles and practices of their understanding of the work of legendary Australian manual therapist Tom Bowen (1916-82). ISBT Foundation and Advanced courses are conducted in Australia, Asia, Europe and South America.